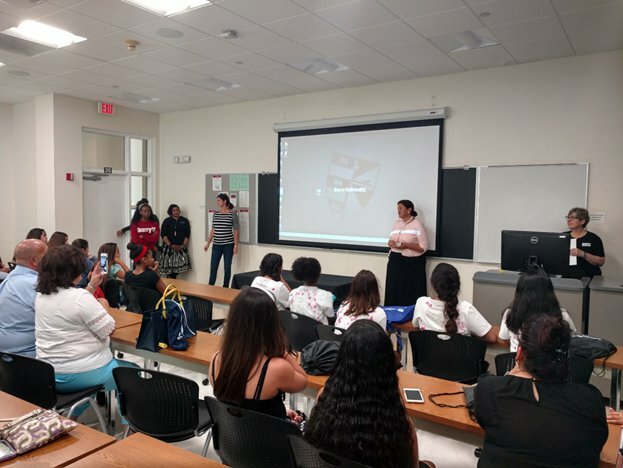 In the summer of 2016, Mathematics and Computer Science Department of the College of Arts and Sciences at Barry University in conjunction with community partner CODeLLA offered two week totally free summer coding camp for underrepresented middle school girls. 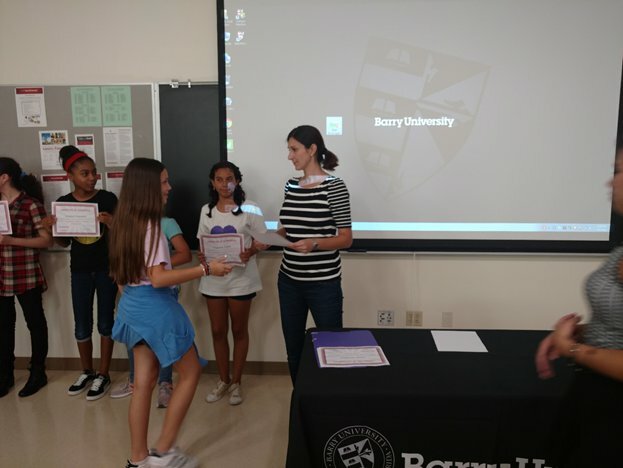 The program director, Dr. Sanja Zivanovic, and the Dean of the College of Arts and Sciences, Dr. Karen Callaghan were pleased with participation of fourteen middle school girls. They are both hoping to make this an annual event at Barry University. The camp ran from 9am-3pm on week days with free lunch at the university cafeteria. It was taught by our professor Dr. Sandra Armstrong and assisted with three of our computer science students, Roland Schiller, Stephanie Rolle, and Cortesha Harper, along with a high school volunteer Lourdes De La Pena. 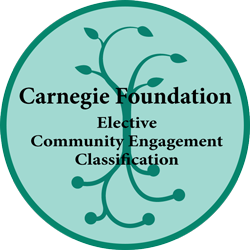 The curriculum at the camp introduced young girls not just with fundamental concepts of computer science, such as algorithms, loops, conditionals, functions, parameters, and variables, but also with concepts of design thinking, collaboration, and social awareness. All of these concepts were emphasized through lessons and activities that Dr. Armstrong thoughtfully created. 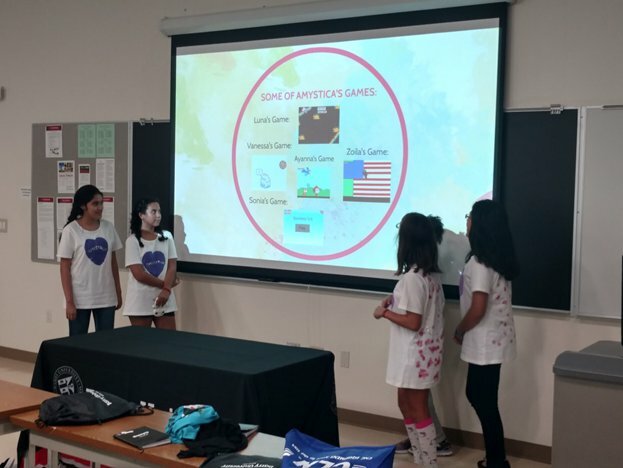 Girls worked collaboratively in groups and the focus of the camp was for each group to create a game in Scratch that solves a problem in the community. College of Arts and Sciences hosted a ceremony for parents of the girls that attended the camp. 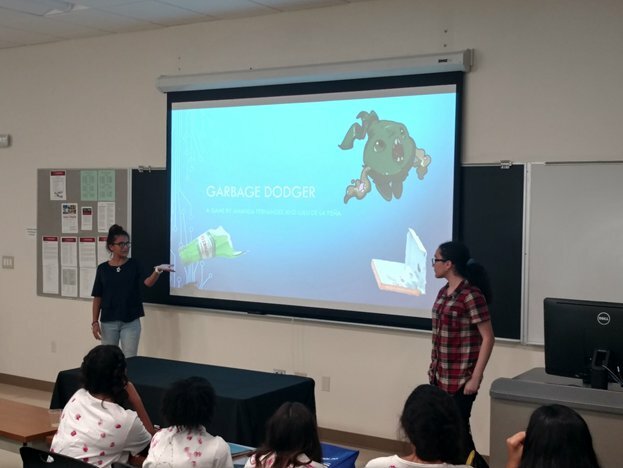 At the ceremony, girls presented their game via power point presentation showing their end product, communication skills, and ability to work collaboratively. Parents were extremely pleased with the achievement and education their girls received in the camp, and the girls seemed to enjoy relaxed but yet scholarly environment. 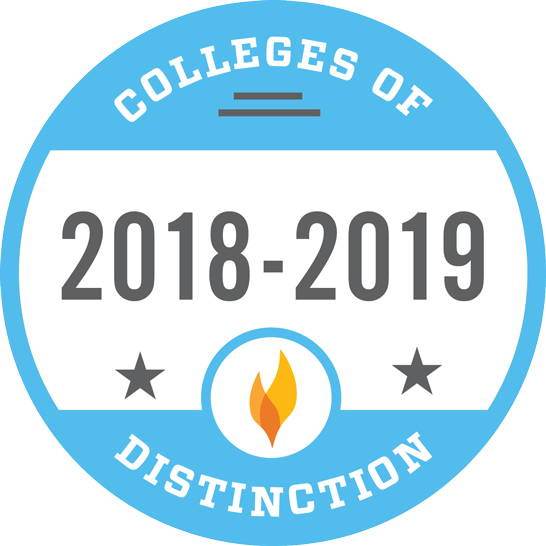 MAT 213 – Calculus III with Dr. Zivanovic has been approved for Service-Learning Designation. Codella is an organization which works with Latina girls ages from 9-12. They offer after school digital literacy and coding program as well as 6 week Coding Immersion and Tech Entrepreneurship Camps. 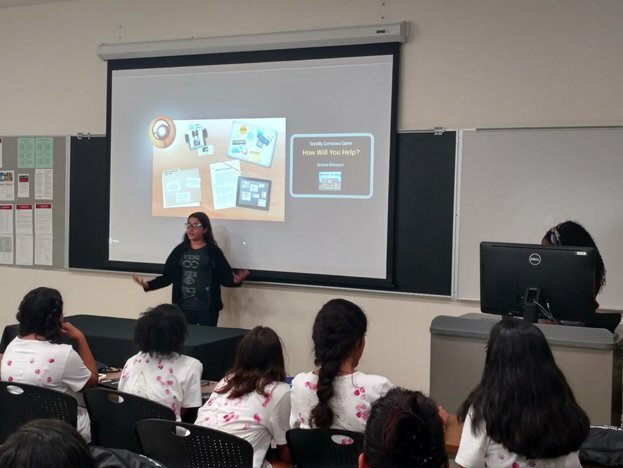 “The main goal of Codella is to empower the next generation of Latinas by building an invaluable skillset and giving them the confidence to pursue careers in STEM” (www.codella.org). In the summer of 2016, we expect to have Codella summer camp taught on Barry campus. In the summer of 2015, both Dr. Ricardo Jimenez and Dr. Sanja Zivanovic had taught in the Codella summer tech entrepreneurship camp. Dr. Jimenez built a battery with students using basic household items and an 8 led display that simulated binary code using switches. He taught students how to compile a computer from scratch and flew a drone with them. Dr. Zivanovic’s main goal for the camp was to increase students’ appreciation of mathematics through beautiful mathematical objects known as fractals. She used computer program XAOS to get students interested in fractals, and used python turtle to code some of them. Moreover, students went on a scavenger hunt for fractals and build a 3D fractal with marshmallows and toothpicks. Advisor: Mr. Michael Wise is a laboratory technician in the Physical Sciences Department. Abstract: After years of complaints from professors, staff, and students that certain rooms and/or buildings at Barry University are very cold, we decided to look into efficiency of air conditioning (A/C) that is in use. There are several items that can be looked into when it comes to improving A/C efficiency such as temperature of the room, humidity, air quality, A/C unit itself, and level of CO2 in the room. For the purpose of this project we will focus on evaluating room temperature and humidity based on the outside climate conditions. In particular, we will collect temperature and humidity measurements of several classrooms. We use the Arduino platform to develop an economical temperature and humidity logger. Arduino is an open-source microcontroller unit that utilizes an 8-bit AVR chip and other hardware which allow it to be easily programmable and interfaceable. We interface an Arduino Uno R3 with a data logging shield for SD data storage and real time clock capabilities, and an HTU21D-F high precision temperature and humidity sensor. The Arduino is programmed to awaken from sleep at set intervals of time to write the sensor values to the SD card. Once data is collected, we will compare it with recommended room temperature and humidity, calculate possible energy savings, and essentially obtain cost savings. Cassandra Denning, a junior, came to Barry University for its caring atmosphere, its added religious dimensions, and its scholarship opportunities. She combined her love for mathematics and her passion for art to pursue her double major in Mathematics and Art. Her involvement in Phi Sigma Sigma, Campus Ministry, and the AMP Club led her to this S.T.E.M. project. She enjoys arts and crafts, reading, and music. Her ultimate goal is to become an architect. Riann Zabaleta, a senior majoring in Biology, came to Barry University because of the many undergraduate research opportunities. Her coursework provided a solid foundation for her S.T.E.M. research activities. She enjoyed the research process and plans on following a research path upon graduation. The location of Barry University in Miami led her to pursue activities of scuba diving, sailing, and tennis. Vania arboleda is a sophomore majoring in Biology with a minor in Chemistry. Vania came to Barry as an international student from Peru. Through her involvement in this S.T.E.M. project, she learned a general idea of computer programming and an understanding of Arduino platform. Experiments were conducted in the Powers Annex building and may be expanded into other areas of the Barry University Campus. She plans to continue her studies in the medical field. Daria vasilyeva, a senior majoring in Biology, gained interest in this project through the AMP Club. 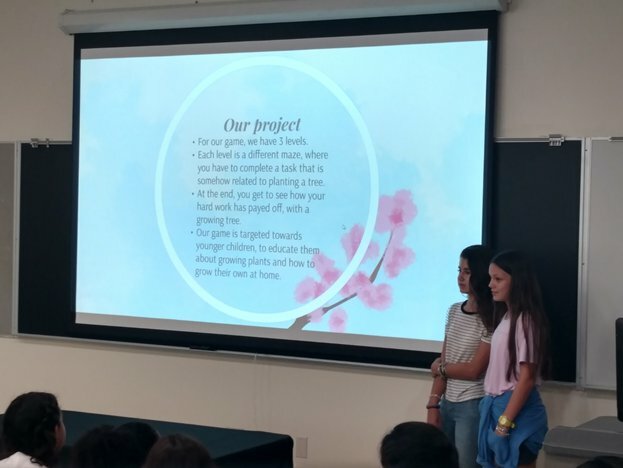 The purpose of the S.T.E.M project was to bring the attention of Barry community to an issue an environmentally friendly air conditioning cooling system with cost savings. Daria learned that mathematics can and should be applied to real life problems through inter-disciplinary synergies. 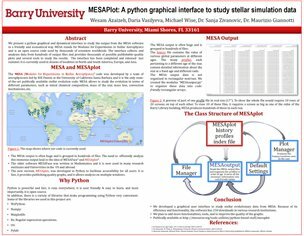 Abstract: We present a python graphical and dynamical interface to study the output from the MESA software in a friendly and economical way. MESA stands for Modules for Experiments in Stellar Astrophysics and is an open source code used by thousands of scientists worldwide. The interface collects and analyzes data from hundreds of output files and provides thousands of possible publishable-quality plots and several tools to study the results. The interface has been completed and released last summer. It is currently used in dozens of localities in North and South America, Europe, and Asia. Wesam azaizeh is a senior majoring in Biology with minors in physics, chemistry, and mathematics. Through programming in Python and WXpython, Wesam learned about problem solving, collaborating with other scientists and sharing responsibilities. Much was learned through the help and guidance from Dr. Zivanovic, Dr. Giannotti, and Mr. Wise. This gratifying experience provided highly interactive, personalized, hands-on research experiences that is not found in larger universities with oversized programs. This S.T.E.M. project helped build a strong foundation that will greatly increase his chances to be admitted to a quality graduate program. His career plans include pursuing a PhD in infectious diseases and then a MD to practice as a physician researcher. 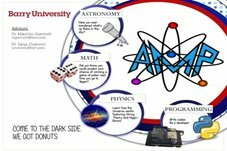 AMP – Astronomy, Math and Physics Club is a collaboration between the Mathematics and Computer Science Department and the Physical Sciences Department, serving students from various majors such as Biology, Chemistry, Math, and Computer Science since Fall 2012. In Fall 2014, AMP partnered with Doctors Charters High School encouraging interested high school students to attend club meetings. At the 2014 Green Day - Miami Shores Street Fair, AMP demonstrated electric generators built during club meetings. 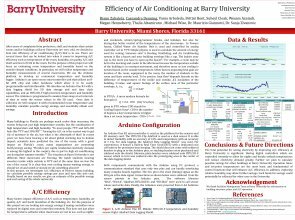 In Spring 2015, AMP worked on evaluating efficiency of air conditioning units at Barry University. AMP club hosted a booth at Sixth Annual Earth Day Celebration at Barry University. 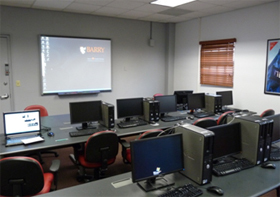 The Department of Mathematics and Computer Science at Barry University in collaboration with Microsoft and the South Florida Digital Alliance will be hosting a free boot camp entitled "Microsoft App Labs for Windows 8 Developers." This event is open to college faculty and students in Miami-Dade and Broward counties. This is similar to the events that Microsoft has organized or planned in 30 “technology and design hubs” around the world, including San Francisco, New York, Toronto, London, Paris, Berlin, Shanghai, and Bangalore. The event will take place for two days, March 20 and April 10, from 9:00 am to 5:00 pm in Landon Events Room. For more information, please visit http://www.barry.edu/microsoft-bootcamp/. The STEM committee will be hosting the 5th Annual Science, Technology, Engineering, and Mathematics Research Symposium on Wednesday, March 27, at Barry University’s main campus in Miami Shores in rooms 111 and 112 of the Andreas Building. The symposium sessions will take place from 8:00 am to 2:00 pm. This research symposium is aimed at engaging the local scientific community in learning about ongoing discoveries within S.T.E.M. disciplines (biology, chemistry, physics, mathematics, computer science, information technology). For more information, please visit http://www.barry.edu/stem/. 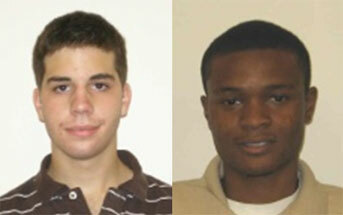 Gaston Arellano, CIS major, received the President's Award, at the 2010 Student Affairs Awards. This highest award recognizes and rewards Gaston Arellano as a Barry's Student Leader, for his tremendous contributions to the Barry campus community and his commitment to extracurricular involvement. Darnell Henry was selected as a Top Technology Student at the 2010 Technology Leadersof the Year Awards presented by the Greater Miami Chamber of Commerce, April 30, 2010. Both are graduating with a B.S. in Computer Information Sciences this summer 2010. Congratulations to both! 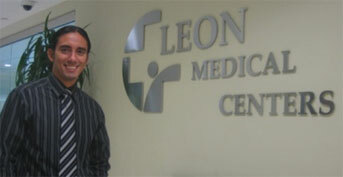 Kudos to Daniel Velasquez, director of graphic arts and design for Leon Advertising part of Leon Medical Centers in Miami. Velasquez coproduced and codirected a 60second commercial that aired locally on CBS4 during Super Bowl XLIV. The commercial aired three times; before kickoff and during the second and third quarters of the game. Daniel Velasquez graduated from Barry University with a major in Computer Information Sciences and a Minor in Business in December 2004. The College of Arts and Sciences hosted the second annual S.T.E.M. Research Symposium (S.T.E.M. Symposium) which was sponsored by Barry University's departments of Biology, Math and Computer Sciences, Information Technology, Physical Sciences and Sigma Xi. The event took place March 26 in Andreas room 111 and more than 250 people were in attendance. The second annual S.T.E.M Research Symposium is aimed at engaging the Barry community to learn about ongoing discoveries within S.T.E.M. disciplines. 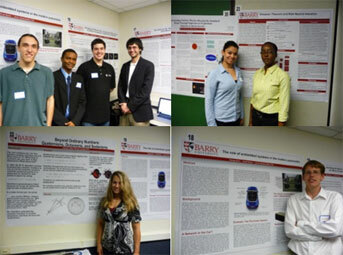 Undergraduate students from Barry University, St. Thomas University and MiamiDade College present posters related to their research accomplishments conducted in Biology, chemistry, computer science, mathematics and physics. There were 45 posters and all presenters were competing for cash prices and after a difficult process of judging from the 22 judges from Barry's College of Arts and Sciences, the School of Professional And Career Education, and St. Thomas University's School of Science, Technology and Engineering Management there were two first place winners with a prize of $150, a third place winner with a prize of $50 and 4 honorary winners with a cash prize of $30. MCS students and faculty presented 10 papers in the areas of mathematics and computer science. 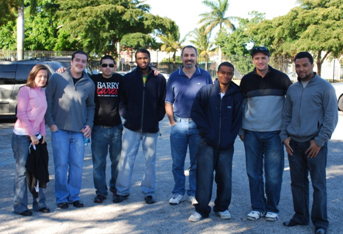 Kudos to Professors Chakib Chraibi and James Haralambides, Staff Saul Jaramillo, and students Emmanuel Bruno, Jean Paul Botello, Darron Clarke, and Darnell Henry from the Department of Mathematics and Computer Science for helping the organization "Serve the People" in their quest to bridge the computer and Internet divide in low income neighborhoods. The project known as "Computer Bridge Program" intends to provide free and/or very low cost Internet connections to residents and businesses in lowincome areas. They have been diligently working on refurbishing donated computers and setting up a community computer center, as well as investigating ways to provide Internet access using wireless technology and devices. Several students and faculty from the Department of Mathematics and Computer Science presented poster presentations at the first STEM Research Symposium, April 3, 2009. STEM stands for Science, Technology, Engineering and Mathematics. Topics included the "Musical Gene", "The Effect of Varying Demosaicing Algorithms on Image Quality", "Artificial Intelligence in Video Games", "Voice over IP", "Reconstruction Algorithm used in Soft XRay Diffraction Microscopy", "Multilevel Routing in 3D FPGAs." 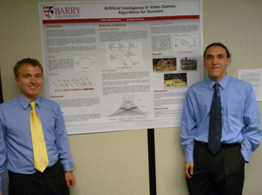 The research symposium is aimed at engaging the Barry community in learning about ongoing discoveries within S.T.E.M. disciplines. 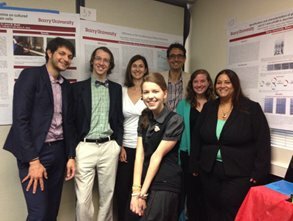 Several undergraduate and graduate students presented their research accomplishments conducted in biology, chemistry, computer science, information technology, mathematics, physics and psychology.Representatives from various science clubs provided information about memberships and ongoing activities. The symposium is sponsored by the departments of Biology, Information Technology, Math & Computer Science, Physical Sciences, and the scientific research society Sigma Xi. The MCS Lab is comprised of 15 Windows XP computers plus one teacher station and one Lab supervisor station. It also includes an LCD projector, a smart board, a printer, and a scanner. There are also several multimedia equipment devices (headphones, speakers, digital camera, and digital camcorder) available upon request. The lab also includes a "brainstorm" corner where students can sit, discuss, and plug in their laptop computers. Each computer is equipped with a plethora of software, including Microsoft Office, Adobe Design Premium CS3, Adobe Premiere, Adobe Illustrator, Visual Studio, TrueSpace, QuarkExpress, Macromedia Director, Maple, MiniTab, Logo, Oracle, mySQL, Pinnacle Studio and JCreator. 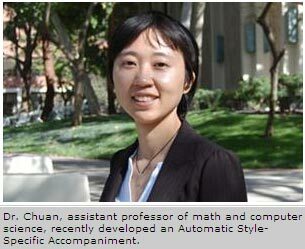 Barry University professor Dr. ChingHua Chuan, who recently developed Automatic StyleSpecific Accompaniment (ASSA), which is a software program that uses artificial intelligence to assist the user in music composition. Chuan is an assistant professor of math and computer science. With this new stateoftheart software, individuals can input a piece of melody into the program, either by humming or by playing on a Musical Instrument Digital Interface (MIDI) keyboard, and the software will automatically accompany the melody, thus providing the user with a completely finished and professional sounding composition. After winning the Digital Dissertation Fellowship Award at the University of Southern California (USC) in the spring of 2007, Chuan (a resident of Miami Beach) was motivated to develop a software system that can automatically generate a sequence of chords to accompany the melody created by the user. The award is designed to foster multimedia research that expands the potential of academic publication through developing and transitional media. Chuan received a grant from USC to complete the research that led to the development of the software. "This project was inspired by the fact that most people, even without formal musical training, can sing karaoke well, but have difficulty composing the same kind of music that they sing with such ease," Chuan said. "Without sophisticated chord arrangements and accompaniment styles, those creative melodies would languish as plain and immature utterances, soon discarded and forgotten." "The chord progression generated will follow the musical style of a specific singer/band/songwriter that the system has learned," Chuan added. "With this system, users only need to sing the melody out loud, and the system will automatically compose it into a song with sophisticated accompaniment, in a style that is similar to the users' favorite band, for instance, the Beatles or Radiohead." Currently, Chuan is discussing the format for releasing the software with various companies who have contacted her with interest in commercializing the product. 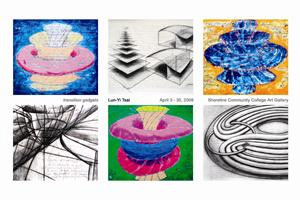 Mr. LunYi Tsai, a faculty member in the Mathematics department exhibited his new paintings through the month of April at Shoreline Community College Art Gallery in Shoreline, Washington. His work is inspired by mathematical structures and objects and is a great illustration of the combination of mathematics and art. His solo exhibition titled "Transition Gadgets," presents encaustic paintings (the painting medium) inspired by the vivid colors of his new home in Miami. Tsai offers an exploration of mappings, which are quintessential mathematical objects. A mapping takes you from one place to another. What distinguishes your starting point from your destination? There are gadgets that allow you to discover these differences. The artist, with the help of his friend and mathematician Aravind Asok, uses the classical example of Hopf mappings to illustrate the act of mapping from a new perspective. "His works bring to life difficult mathematical concepts in a way that makes them approachable to a nonmathematician while giving a new visual image to the mathematician's understanding of the idea behind the concept," University of Washington Math Professor SÃ¡ndor KovÃ¡cs said. "LunYi's artistic touch combined with his enthusiasm and relentless energy to strive to understand difficult mathematical concepts yields absolutely unique results." Construction of the BarryHabitat house continued this past Saturday, October 4, 2003 with the help of Dr. James Haralambides from Computer Science, several Chapter executive and new members. Eight Barry students were present setting up the plywood for the roof. We had a wonderful time with Riva, the homeowner, who is looking forward to working every Saturday with Barry volunteers. On Saturday, January 10th, 2004, the Executive Division, Department of Computer Science, and Division of Information Technology helped lay sod and plant trees in what is the last stage of construction for the BarryHabitat house. The Chapter was honored to have Maryellen Letsche from the Executive Division and her daughter, Lauren, a senior in the School of Business, Dr. Chakib Chraibi from Computer Science, Andrew Seaga from University Web Services and his wife, Amanda, and Chapter officers Chetan Dhakan, Miguel Ramirez, Dan Weihermuller, Susana Lopez, and SueYen Wong in the final building trip of our first house. On Saturday, January 14, 2006 the Divisions of Information Technology and Recruitment and Admissions along with Math and Computer Science joined to help paint and frame a couple of houses that Miami Habitat is building in Liberty City. This was the 4th consecutive year that the Division of Information Technology sponsored a Habitat building trip. As the years have gone by other divisions and departments have joined in showing the community that Barry practices what it preaches. Thanks to John Beaubrun for leading this effort and to DoIT for sponsoring lunch. Special thanks go to Helen Corpuz, from Recruitment and Admissions; Terry Kushi and his wife, Rick Estavillo, Jose Ramirez and Martin Dimkovski from Information Technology; and Dr. James Haralambides from Math and Computer Science for their volunteer efforts to change the lives of a couple of families and to strengthen the Liberty City development. "Despite Global Concerns Over Outsourcing, the Game is Not Over for IT Professionals"
On November 5, 2003 reporting on the controversial practice of outsourcing jobs such as call centers, financial analysis work, IT management, and even U.S tax preparation to India, MSNBC interviewed Dr. Chakib Chraibi, associate professor of Math & Computer Science at Barry University. Dr. Chraibi explains that outsourcing is not a new phenomenon, although it is new to the technology sector. Studies has shown that in the long run the direct savings in wages are offset by higher costs from travel, communications, remote managerial oversight, and customer relationship management. Dr. Chraibi states that. "The bottom line is that information technology investments and high skilled staff make companies more profitable, flexible, and productive" and still recommends IT/Computer Science is a worthwhile course of study.